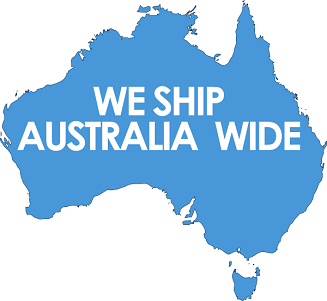 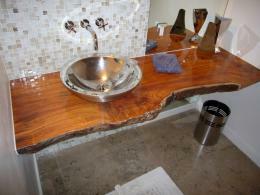 NT Lumberjacks is a specialist supplier of unique Australian grown tropical hardwood timber products and timber vanity slabs. 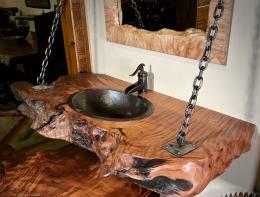 We constantly look for unique and interesting timbers that will create beautiful rustic bathroom vanities – once selected each piece is cut to a blank and kiln dried for crafting into stunning works of art that set your home apart. 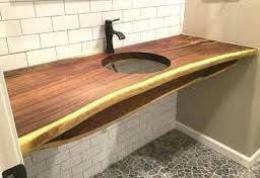 You can be proud that your vanity timber is ethically harvested and no rain forests have been harmed as these are salvaged from trees (logs) that have been removed from Darwin’s City Parks and home gardens. 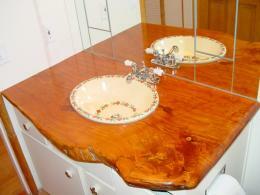 All our vanity tops are supplied kiln dried / dressed and sealed with 2 pack epoxy. 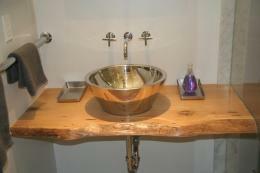 One main advantage of dealing with NT Lumberjacks is that we have a high speed vacuum kiln – normal drying time for a slab is 1 year PLUS another year for each inch of thickness – so a 6 inch thick slab takes 7 years to dry – Our high speed vacuum kiln will do that in 3 weeks allowing us to cut a custom vanity slab to your requirements and still meet your project deadline.